You want to have the most powerful SEO tools at your disposal, but you have one problem on your hands. Your computer and hosting plan can’t handle it. Sure, you could install GSA Search Engine Ranker and enjoy some of the benefits, but you know your computer and shared hosting plan would chug along in an effort to keep up. Plus, as long as GSA was running, you wouldn’t be able to do anything else on your computer. All of your resources would be tapped out, so you would be stuck sitting on the sidelines waiting for GSA to finish all of its tasks. Considering how much time it would take your computer to get anything done, it might be weeks before you would be able to surf the internet or watch something on Netflix again. Do you really want to wait that long to use your computer? That’s where a VPS from Sprious can help. A VPS, or virtual private server, provides you with all of the resources you could possibly want. You log into the network using the provided credentials, and then you get to use all of the server’s resources. These servers are stacked to the brim with resources, too. An SEO VPS server can come with as much as 24 GB of RAM and 24 CPU cores. Of course, you don’t have to get one with that many resources. You can get something with 2 GB of RAM and 2 CPU cores, plus a 20 GB Pure SSD hard drive. Either way, you’ll have ample resources to run GSA Search Engine Ranker. It really just comes down to what you want to run with the search ranker. If you need a ton of resources at your disposal, go with the most powerful VPS you can get. If you just need to run GSA SER and some other tools, a basic VPS will work. Once you get your VPS, you’ll be abler to install GSA SER and make use of all of its features. Let’s see what you’ll be able to do once you install GSA SER. Keep in mind that you can unleash all of these features with your server. You won’t have to hold back at all. Then, let’s go over some tips for using the software. These tips will ensure that you get the most out of the software. What Is the GSA Search Engine Ranker? 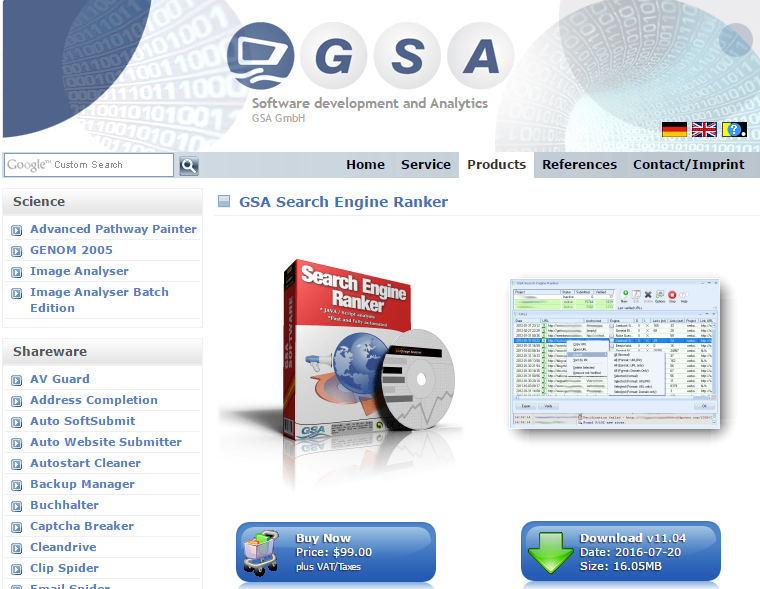 The GSA Search Engine Ranker is link-building software. As probably know, you need links to move up in the search engine rankings. Search engines, like Google, look at backlinks when they assess your site. The more quality backlinks you have, the higher your ranking will be. Because of that, you want to have a lot of quality backlinks. Unfortunately, building backlinks manually is a time-consuming process. You have to find the places to build the backlinks, and then you have to input all of the data. There are CAPTCHAs to solve and links to check. Then, you have to rinse and repeat. By the time you finish a few links, you’ll be ready to call it a day. The GSA Search Engine Ranker automates the process. It goes out, finds sites with high page ranks, and then gets links for you. Then, your site will move up in the rankings. You just input a few settings, and it handles the rest. This saves you a ton of time and energy, especially when you run it on an SEO VPS. That’s a basic overview of how the software works. Now, let’s go over some tips for setting up a project. Once you install the software, you’ll want to get started. Don’t jump in quite yet, though. Take a few minutes to read over some tips. Then, you’ll be ready to use your VPS to deploy GSA Search Engine Ranker. A VPS is a great first step in deploying a powerful tool like the GSA Search Engine Ranker, but it is just the first step. If you’re going to do any serious damage, you have to use proxies. Otherwise, you will get shut down before you make any headway in your link-building campaign. This is where a lot of people get tripped up, though. They don’t know how to pick proxies. You need to think of the type of proxy that you need to select. People typically think that a web proxy is a web proxy. As long as they get a proxy, they are covered. Proxies actually come in different shapes and forms, and it’s essential that you get the right one so you can get the most out of the GSA SER software. First, you have public and private proxies. These are the broad categories of proxies. Public proxies are just as they sound. They are open to the public. They are typically free to use, and anyone can log in and use them. That sounds great, doesn’t it? After all, who doesn’t like something that’s free? That’s what makes the world great, right? Actually, most things that are free are riddled with problems, and proxies are no exception. Free proxies come with a price tag of their own, and that price tag comes in the form of your privacy. You typically aren’t protected when you use free proxies. That means that people can easily detect what you’re doing online. Of course, using GSA SER to build links is perfectly fine, but one of the great things about proxies is being able to maintain your anonymity. Are you really willing to give that up for a free proxy? You also have to worry about your safety with free proxies. Many are run by hackers, so you might have to exchange your personal information and your good credit for a chance to run the GSA SER software for free. You know that’s not worth it. On top of that, you won’t get the speed that you want with a free proxy. You have to share your resources with too many people when you go with free proxies. There typically aren’t enough resources to go around, so you’ll end up with a sluggish performance that won’t get the job done when you’re building backlinks. In fact, your proxies might time out when you’re in the middle of building links. The software might have to quit in the middle of a job. Is that a risk that you’re willing to take? Now that you know that free proxies aren’t right for you, that leaves you with paid proxies. You have a few options when it comes to using paid proxies. Semi-dedicated paid proxies are the cheapest option. You get a handful of IP addresses that you share with a couple of other people. This works well with something like GSA SER. As long as you aren’t using Facebook or another social media account, semi-dedicated proxies are a great choice. You still get a great deal of speed, plus all of the anonymity you expect with private proxies. Dedicated proxies provide you with IP addresses that only you will use, while rotating proxies rotate the IP addresses out every 10 minutes or so. If you want to pull a lot of data from websites at once, you might want to go this route. Rotating proxies make it much more difficult for websites to detect you. They might start to figure out what’s going on, but then you’ll get a fresh IP address. They’ll have to start all over again at that point. You’ve Picked the Type of Proxy – Now What? Picking the type of proxy is only half the battle. You also have to think of the speed of the proxy. Latency is a serious issue when selecting proxies. Some proxies experience a lag when connecting with a VPS. That lag makes it hard for the GSA SER software to do its job. Fortunately, there is an easy way around it. Just go with a VPS that has proxies in the same data center. When you pick up a proxy and VPS that are in the same data center, they can communicate seamlessly. Then, you don’t have to worry about latency. You don’t want to set up your proxies and software to run when you’re sleeping, only to come back and realize that they didn’t do anything because the proxies weren’t authenticated. When you get proxies, you also get authentication tools. These tools often come in the form of a username and password. GSA SER has a spot to input your authentication information. Make sure you authenticate your proxies before moving forward. If you fail to do this, GSA SER will just idle and won’t be able to use any of its cool features. That means it won’t be able to help your site out when you’re sleeping. You want to get an SEO boost when you’re sleeping, so take the time to authenticate those proxies. The GSA SER software lets you use a high number of threads for your search. Threads are the open connections the GSA SER software uses to pull data, so it makes sense that you would want a lot of them, right? After all, the more data it pulls, the faster you can get the job done and move on to the next task, like taking advantage of that front-page ranking. While that sounds good in theory, too many open connections can actually slow you down because they throw up red flags to Google and other search engines. You need to be smart, even if you’re using proxies. When you’re using the GSA SER software, you should limit yourself to an open thread for every 10 dedicated proxies. If you’re using semi-dedicated proxies, have an open thread for every five proxies. This will prevent the search engines from detecting your activity and shutting your proxies down. It might slow you down a bit, but the GSA SER software will still work much faster than you would be able to so you will hardly notice the reduction in speed. Plus, it can work when you’re sleeping, so the job will be done in no time at all. You will wake up to a world wide web full of backlinks that all point to your website. That’s a great way to get a boost in the rankings. When you’re involved with internet marketing, you want to reduce redundancy. You don’t want to repeat your backlinks, just like you don’t want to repeat the work you have to do to get them. Search engines don’t like repeated links. Even if the search engines aren’t bothered by links, you’re just wasting your time if you go out and get the same link twice. Fortunately, you can back everything up with the GSA Search Engine Ranker so you don’t have to worry about repeating any of your work. Then, you will have a copy if you want to switch servers or if your software crashes. Go to the project that you want to back up and right-click on it. Then, you need to select “Modify Project” and click “Backup All Projects.” Once you do that, you just need to follow the steps to save your project data. After your data is saved, you never have to worry about redoing any of your work. You will have a copy ready in case you need it. It’s no wonder why so many people use a VPS and the GSA Search Engine Ranker. When you use these two together, you’re able to reach your SEO goals in no time at all. They pack a powerful one-two punch, making it easy to take down your competition. If you’re ready to shine, get a VPS and the GSA SER software. Then, follow these tips. It won’t be long before you’re at the top of your SEO game.